At the new year, I always study another art media so I can grow as an artist. Last year I learned all about polymer clay and created a bicycle themed Mosaic. This year I have become very interested in fabric etching, especially the process of devore. 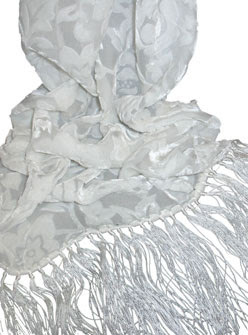 Several artists purchase scarves already etched and dye them, but I will etching my own designs. I plan to add scarves to my booth this year in cut velvet and satin devore.